Just short of 400 guests assembled in London to celebrate the successes of BRDC Members, SuperStars and Rising Stars on Monday 4 December. Reflecting on a year in which three Members of the British Racing Drivers’ Club (BRDC) became FIA World Champions, there was plenty to celebrate at the BRDC Annual Awards Lunch which was hosted and compered by Jake Humphrey at the London Hilton on Park Lane, a venue at which the BRDC had last hosted an event some 30 years ago. The ceremony was well attended by the great and good of British Motor Racing, including 2017 Formula 1® World Champion Lewis Hamilton MBE, Martin Brundle, Derek Warwick, David Coulthard MBE and Dario Franchitti MBE. The prestigious event attracted a wide range of other distinguished guests such as Chief Executive of the Formula One Group Chase Carey, who presented trophies during the ceremony. 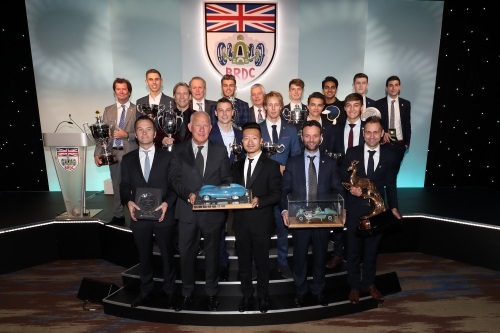 As well as celebrating the many on-track success stories from throughout the Club, the BRDC Annual Awards also gave its many guests an opportunity to support the Club’s own recently renamed charity, the BRDC Motor Sport Charity. Thanks to the generosity of the Members and guests in attendance, £5,500 was raised which will go towards providing assistance to people in the motor sport industry during times of need. Welcoming applause was given to proud BRDC Member, 2017 FIA World Endurance Champion and 2018 Toro Rosso F1® driver Brendon Hartley as he personally received the Bruce McLaren trophy and his Special BRDC Gold Star. Fellow World Championship winning Porsche teammates Earl Bamber and Timo Bernhard were also invited onto the stage to join Brendon in receiving the coveted Silverstone-Le Mans Challenge Trophy, as well as reflect on a superb year in a category of motor racing very close to the heart of the Club. British Formula 1® World Champion Lewis Hamilton MBE was awarded not one, but two, BRDC Gold Stars, the BRDC’s premier annual award recognising the strongest performance of the year in international motor racing, with the second Gold Star awarded for winning the Formula 1 Drivers’ World Championship. This achievement sees Lewis become the most decorated recipient of BRDC Gold Stars in the history of the Club by surpassing the record of 10 Gold Stars previously set by Sir Stirling Moss OBE. The World Champion had a fantastic season with the Brackley based Mercedes AMG Petronas Formula One Team, winning nine Grands Prix from a total of 20 including his home Grand Prix at Silverstone July, the fastest lap at which resulted in him also being awarded with the Johnny Wakefield Trophy. Sahara Force India Technical Director, Andrew Green, collected the Sir Jackie Stewart Award for his engineering brilliance that led to the team recording the heaviest ever points haul in the Formula One Constructors’ Championship. British Formula One hopefuls George Russell, receiving the John Cooper Trophy, and Lando Norris, receiving both the Richard Seaman and Spencer Charrington Trophies, were in attendance and shared insight into their Formula One testing experiences in 2017 as well as their championship winning seasons. Both as former winners of the McLaren Autosport BRDC Award, they would have also been delighted to see Dan Ticktum receive the Chris Bristow Trophy having been announced the 2017 Award winner at the previous evening’s Autosport Awards. BRDC British Formula 3 Champion, Enaam Ahmed, and Euroformula Open Champion, Harrison Scott, were honoured at the event with the Jim Clark Trophy and the Graham Hill Trophy respectively, giving due praise to their seasons that saw them both establish themselves as ones to watch for the future. The event concluded with the presentation of the coveted BRDC Gold Medal to former BRDC President Derek Warwick in recognition of his exceptional contribution to British motor racing and years of service to the BRDC.